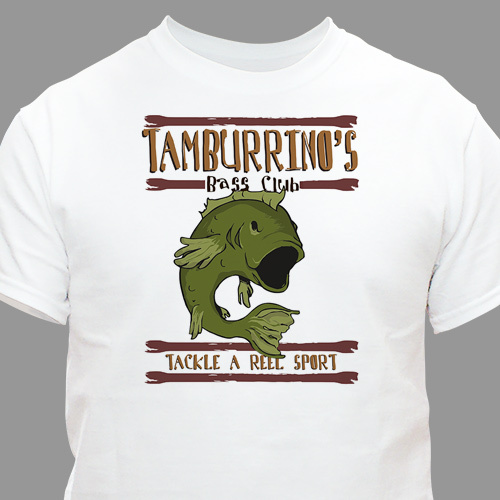 Proudly display your passion for bass fishing with these Bass Fishing Personalized T-Shirts. Our Bass Club Personalized Bass Fishing T-Shirt is available on our premium white 100% cotton Personalized Shirt, machine washable in adult sizes S-3XL. Also available in a handsome Ash Gray. Includes FREE Personalization! Personalize your Bass Fishing T-Shirt with any name. great idea to change things up & add that personal touch, great prices & super fast service, can't wait for the family fishing get together in Maine to present these T-shirts to everyone. These Personalized Bass Fishing & Hunting Gifts are perfect gift selections for Birthdays, Anniversaries, Father's Day & Christmas. Be sure to look at our entire collection of Personalized Bass Fishing & Hunting Gifts for Him.